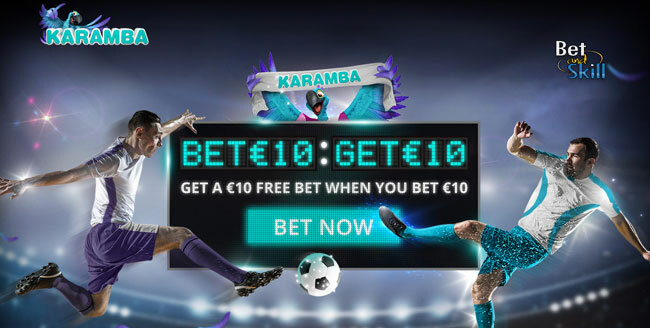 Karamba Betting Bonus - get a €/£10 free bet when you bet €/£10! Karamba Sports is now live! 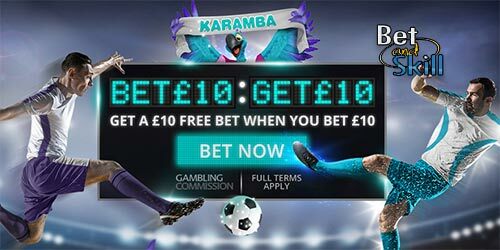 One of the most appreciated online casino has recently added their Sportsbook (provided by SBTech) and are offering all BetAndSkill readers an exclusive welcome offer - Bet £10 and get £10 free bet to enjoy the new Karamba betting site! Have you recently visited Karamba's website? Have you noticed that a new 'Sports' tab is available on the Main Menu? Yes! Karamba has joined the online sportsbetting industry and is taking it by storm! Their Casino has a generous offer so their betting bonus can’t be poor! 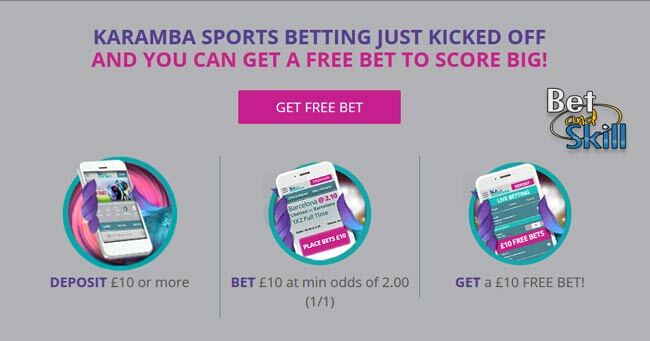 Karamba Sports are offering all new players a £10 free bet as soon as you place a £10 bet, and you can claim it in few simple steps! 4. Bet €/£10 at minimum odds of 2.00 (EVS) and get a €/£10 free bet! Karamba offers bets on many kinds of sports, including football, tennis, basketball, all the major sports and eSports betting too! At Karamba Sports you are in control of your bets with the Cash Out feature. There a lot of other betting features, including the Fast Markets and the Karambot. You can access all other products (Casino, Live Casino, Scratchcards, Slots, etc..) via a single user account. Karamba is licensed and regulted by the two most authoritative gambling commissions in Europe - the MGA and the UKGC. Karamba Sports is also offering a free bet to all new customers based in Sweden, Norway, Finland, Germany, Holland, Switzerland and Austria. The offer basically is the same. Bet €10 and get a €10 free bet! The qualifying bet must be placed at odds of EVENS (2.00) or more. Free bet token can only be used on a coupon with total odds of 1.80 (4/5) or higher. Offer only applies to players who are residents of United Kingdom, Sweden, Norway, Finland, Germany, Holland, Switzerland, Austria and Canada. "Karamba Betting Bonus - get a €/£10 free bet when you bet €/£10!"